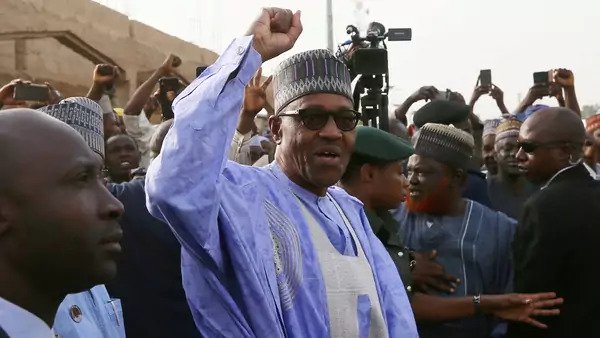 The Independent National Elections Commission (INEC) has announced that Nigeria’s incumbent President Muhammadu Buhari has been re-elected, defeating former vice-president Atiku Abubakar by a substantial margin. According to INEC, Buhari’s All Progressives Congress (APC) received 15.2 million votes, while Atiku’s Peoples Democratic Party (PDP) received 11.3 million. Buhari carried the north and most of the west including Lagos, while Atiku carried the south, the oil patch, and the east. The two divided the middle belt. The geographic breakdown between the two candidates follows a familiar pattern in which elections are decided in the west and the middle belt. Voter turn-out was very low. There were about 80 million voters registered; about 72 million picked up their voter cards, necessary to vote. But, according to early reporting, only about 26.5 million actually cast ballots, or about a third of those who picked up their voter cards. Observers had predicted that the election would be very close, despite Buhari’s incumbency advantage. But the size of Buhari’s very large margin of victory is likely to raise questions. Thus far, election observers are not claiming widespread fraud. But the very low turnout also raises questions. Of late, election rigging in Nigeria has centered on voter suppression and vote buying. There will be questions about whether voters were kept away from the polls by the security services, which would favor Buhari. Some civic groups had objected to security service deployments to polling places, ostensibly to maintain order. INEC’s postponement of the voting by one week, claimed for logistical reasons, also likely reduced voter participation; voters often travel home some distance to cast their votes, and many could not afford to remain away from work for a week. Moreover, low turnout may also reflect a general lack of enthusiasm for both candidates, who were of the same generation and often perceived as more alike than different. Some Nigerians are also concerned that the low turnout may reflect growing disillusionment with democracy in a country where insurrections continue; there is violence over land use, ethnicity, and religion; and poverty is likely to be increasing. Atiku Abubakar and the PDP have rejected the result. The question is what they will do next. The most likely option is that they will challenge the results in the courts. It also remains to be seen how PDP supporters react. Thus far, there are no reports of rioting, such has occurred in the past when election results have been announced, though it is still early. However, the fact that both candidates were Fulani Muslims means that ethnic and religious identities are less likely to play a role in inciting post-election violence than in the past where each presidential candidate was identified with either Christianity or Islam.